An interesting post by another blogger has touched a nerve. She writes of receiving a less than satisfying recognition from her organization in observance of the tenth anniversary of her employment. I can relate to this. 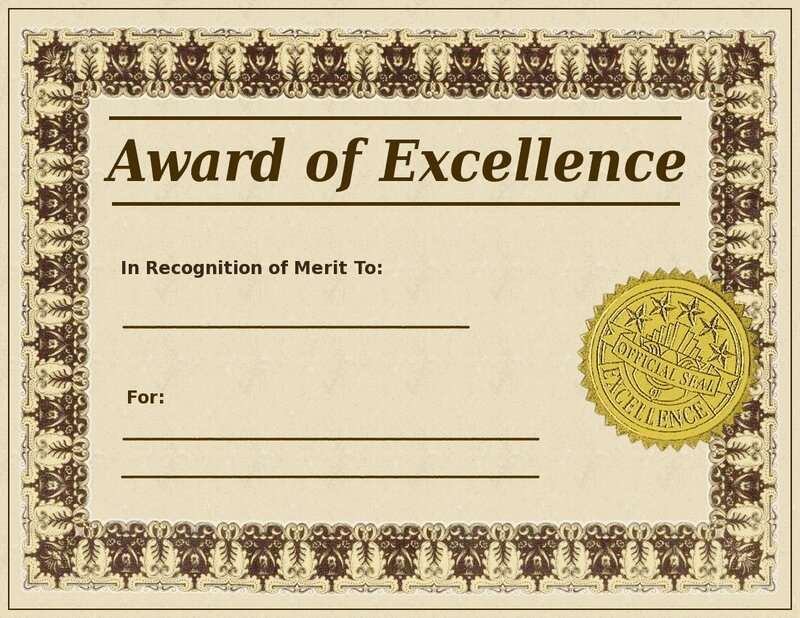 While I had my own share of insincere exchanges with management during my own career, what got my attention in her post– and I hope the blogger will forgive my inartful diversion from the crux of her point– is how her employer acknowledged her service: with a cheesy plaque rather than something meaningful. It made me think about similar career “keepsakes” that I retain, and whether my continuing to hold onto them makes any sense. Each time I changed jobs and moved to a new city, I always put myself through a kind of rigid discipline of sorting through my files containing personal records, mementos, and photographs. I wanted to cut down on the clutter. I do have sentiment about certain objects in my life, but I also like to stay as lean as possible with possessions. Do I keep the old high school and college yearbooks? Absolutely. Letters from my both of my parents? Of course. Scrapbooks and photographs? Mostly, but these should at least be scrutinized a bit for continued relevancy. That snapshot of me with office interns from 1998 can probably be tossed. How about awards, plaques, certificates, etc. from a long career? I’ve always believed they are important. However, as I now look in the rear view mirror, I think those need to be scrutinized further. I still have a file devoted to HR copies of promotions, salary increases, and award/bonus payments. At one point I thought some of these would be useful when it came time to retire, and I might need to refer to them in case HR formulated my retirement annuity incorrectly. But in fact I never even gave a moment’s thought about them. I requested my official estimate, and I was fortunate to have the wonderful Blue Eyes watching over my affairs like a mother hen. So why still keep this file? I clearly don’t need it anymore. It needs to go. But wait. What if in December when my supplemental kicks in and it is configured incorrectly? I can just see myself lying awake at night wondering if I should have kept those papers. The absolute reality is that even if that were to be the case, I’d have no earthy idea what I’d do with any of them anyway. So they apparently stay in that file then as a kind of security blanket Ah ha, so that’s why my mother kept all those monthly electric bill payments for ten years running in her bottom bureau drawer. Great, it’s genetic. Then there are those certificates, awards, and plaques. Some are framed, some are unframed. All sit in a box in the closet. I have a picture of my receiving one of these plaques from a famous person, and that one also sits in the same box. I was never much for “ego walls” in my office. I had my masters degree diploma displayed only because it credentialed me for those who may have questioned my qualifications. Otherwise I hung pictures of family, friends, and lots of winery and vineyard photos from trips I made to Napa, Sonoma, and Paso Robles. My absolute pride and joy was a framed newspaper picture of Richard Nixon on a trip to the former Soviet Union visiting a market. 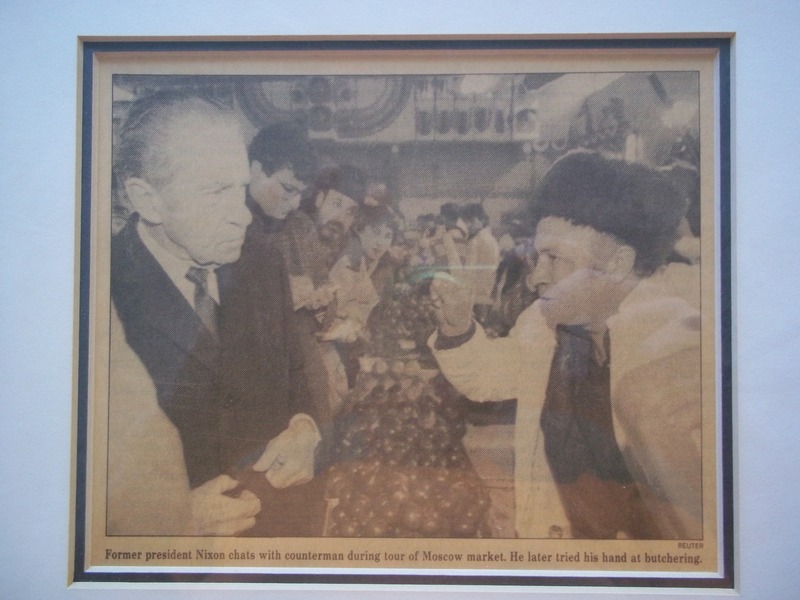 I couldn’t resist the caption: “Former President Nixon chats with a counterman during a tour of a Moscow Market. He later tried his hand at butchering.” It’s fair to say that I had more satisfaction in attempting to be irreverent than to boast of my career plaudits. I know many people who have home offices which are filled with the memories of their career. Seeing them on a daily basis gives them a sense of satisfaction and pride for all that they’ve accomplished. To them I bow and give a hearty congratulations on their achievements. It’s good to have a sense of completion. But I don’t have the same desire, or at least a need to display my career accomplishments. I have my memories, and I draw from a few now and then for wonderful cocktail hour anecdotes. Just ask my wife, I’m sure she probably knows a few by heart at this point. I am proud of nearly all that I achieved for my efforts, and I’d rather not have a rear view mirror as my constant vision. I want to look forward only. I find that to be a more healthy pursuit. Not that long ago we visited a Goodwill Store to browse at all of the treasures. Gorgeous wanted some old bowls and vases in which to store her painting supplies. One bowl, a now tarnished silver, had an inscription written on it that piqued our interest after we brought it home. After some amount of elbow grease to bring the writing into view, we saw that it was an award for “Woman of the Year” from some local auxiliary society. We Googled the woman’s name and learned that she had a long career in business, and had passed away only two years ago. Her family must have kept what they felt was important and donated the rest. Was this bowl a memento for which the woman felt great pride? Did it sit on top of a fireplace mantle or was it relegated to a back porch room and filled with matches from favorite restaurants? For several beats we felt sad about the bowl and this stranger’s memory. But we decided it was better to keep her spirit alive in our own small way. Maybe using it for the creation of artwork is better than it sitting on some dusty shelf at a thrift store. “Scenes of unimportance like photos in a frame, things that go to make up a life,” go the lyrics of a favorite song. Over the next several weeks, I will make an attempt to look over all that I’ve saved from my career and try to make some decisions. I know that I’ve saved some funny memos and letters, and those are definitely worth keeping if for no other reason than they might be great blog fodder. There are pictures of dear former co-workers, and without a doubt I will want to save those. But what about those cheap plaques? I think their time has come to be recycled. If you see one in a thrift store soon, feel free to buy it. It might be worth millions someday. I received a (fake) gold clock for my 25th service anniversary. After carting it to two new houses, I tossed it. It had stopped working a while back. Thought I would miss it but I haven’t given it a thought until I read your post. Nope, don’t miss it at all. Precisely! If it ain’t real gold, then forget it. and if it is, sell it! Great read! Yours is now becoming one of my favorite bogs to read. I find this to be a very interesting perspective. My mind has a way of blocking out things I don’t want to remember — it’s a means of self preservation I believe — but that one quirk helps me to keep plowing ahead doing what I need to do to survive. If I stop to focus on the awful tragedies that took place in my life a few years ago I might be utterly immobilized — frozen by the trauma. The brain is an amazing tool and humans are more resilient than we think. My faith helps immensely too — God is good! You are most kind, and I do thank you. I toss these things out there, and sometimes I’m really not happy with what I’ve written in the “afterglow” of a re-reading. This one turned out too disjointed for me. But nonetheless I’m awfully grateful for your thoughtful comments. I think you’re absolutely right that self-preservation is the great enabler, and I think it’s a positive one. Blinders aren’t always so bad — they keep us from going mad! As I always suggest to everybody trying to make these decisions: scan or photograph what is important to you then get rid of the actual object… you can always look at the image if you want to…. chances are you won’t! Happy purging! Ah, a wonderful suggestion. Thank you! I am quite simply the worst person I know for throwing meaningless things away. Some might call me a hoarder, but I keep all sorts of things and would probably have the makings of a good scrap-booker. I probably keep meaningless momentos less for what they are and more for what they represent to me. Thank you very much! I am cringing from a few things I did in my last post (repetitious phrases), so your words are a salve to me right now. Much appreciated!